Police riot vehicles might be needed on 2 Feb at the London Apple Store, as Stephen Fry – TV broadcaster and Twitter’s sometimes head of publicity (he and sometimes-TV presenter Jonathan Ross were gassing on the box about it on Friday night) – is speaking at the shop Not now, we understand that it’s been cancelled. Currently it appears like the event might be a non-ticket “free-for-all” as @stephenfry has just confirmed. If only 10 per cent of Fry’s 65,000+ Twitter followers show up, the place – as they used to say, back in the day – will be a roadblock. If it is, Twitter better prepare the Fail Whale (shown when Twitter is overloaded, as Twitter-ers some frustrated, others jubilant for making it in, Tweet their little socks off about the ensuing carnage. Thanks to Anniemole for the pointer. It’ll be the quietest – and perhaps the dullest – riot ever known to man. More like the squidging of clammy fingers on iPhones and the moistening of iGussets. 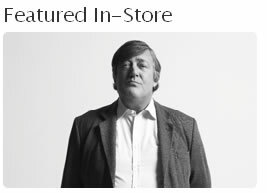 Pingback: Stephen Fry Appearance At London Apple Store: Potential Riot? Do they often do events in the Apple Store? Am I awfully out of touch to not know? Innerpartysystem are doing a live set on the 6th, Eddie Izzard is “in conversation with Simon Amstell” this Friday, Jason Bradbury from the Gadget Show and Snow Patrol are also doing events in the coming weeks.. What’s it all about? !